Well, I must say, this is a first, in India. This is the first time, a mobile manufacturer has thought above the aam janta and hippie attired baboonic youngsters to target their customer base. 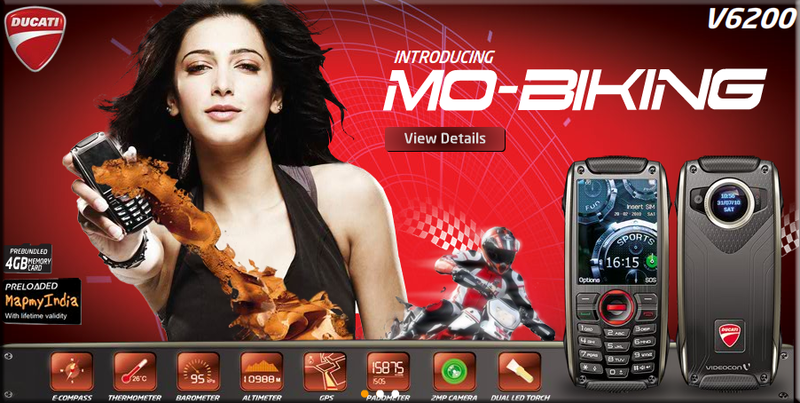 This is the first time a mobile manufacturer has chosen it's target customer base to be Bikers. 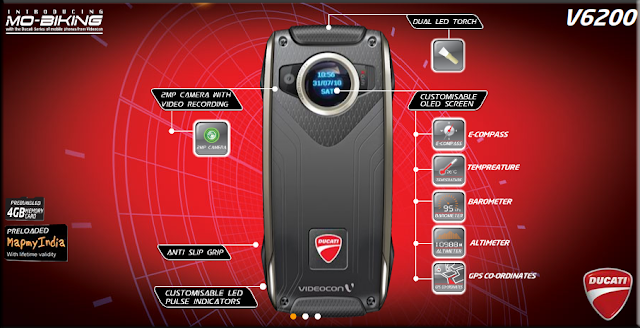 Yesterday Videocon launched the V6200 and dedicated it specially to Ducati. 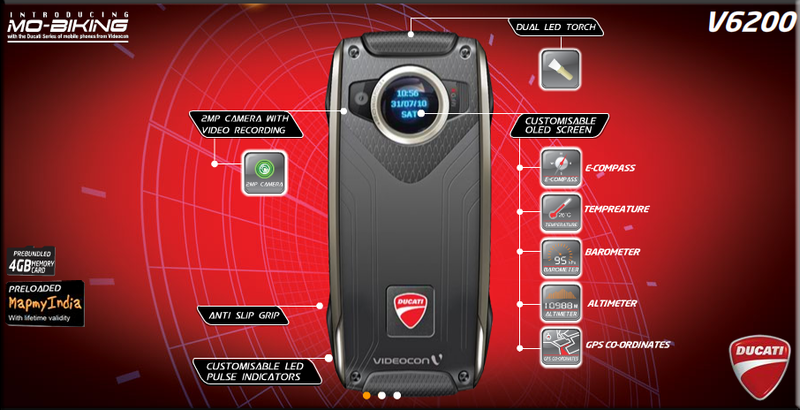 In a dazzling opening ceremony marked with the presence Videcon's Senior Management, actress Shruti Hassan (she looks absolutely stunning) and above all the Ducati Monster in the backdrop, the Videcon V6200 Ducati edition was revealed and introduced to the public. So, how does the phone fair up and what's special in this phone to be called dedicated to a brand like Ducati? Let's take a quick look at it's features. The V6200 not only features the Ducati Red on the central joy stick, but it also boasts off the official Ducati Emblem at it's rear, which is my opinion is really a big deal. I don't remember any telecom company doing that kind of branding with any motorcycle manufacturer. The 6.4 cm TFT screen has 3 modes - Phone, Fun and Sports (like the drive mode selector on bikes). 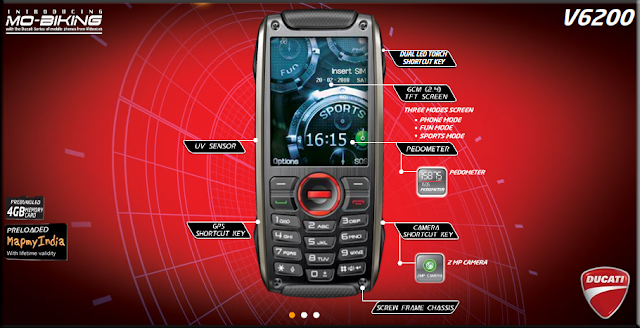 Also, there are dedicated buttons for GPS, LED Torch, Camera and Sports Feature. But from my point of view the best feature of this particular mobile is that the 4GB microSD card for this mobile is pre-loaded with life time validity maps from Map My India which is a great boon to have not only during long tours but also in day to day travel. waste of technology, I mean come to think of it, apart from the Map My India life time valid maps, when does one need Thermometer, Altimeter, Barometer etc!! As far as I can understand, the GPS in the phone would be primarily used in conjunction with the Map My India maps, and there are no other GPS app pre-installed in the phone, nor there would be the facility to have any other app go in, which in my opinion limits the scope of GPS to an extent. There are many biker specific GPS Data Logging apps available on the internet like, measuring your distance traveled, average speed through the trip, actual instantaneous speed etc. which cannot be used with this phone. So, if you are a regular weekend long ride tourer, this phone is just for you as apart from being associated with an exotic brand like Ducati, the phone provides useful tech during long rides. Else, there are other more entertaining phones in the same price range.